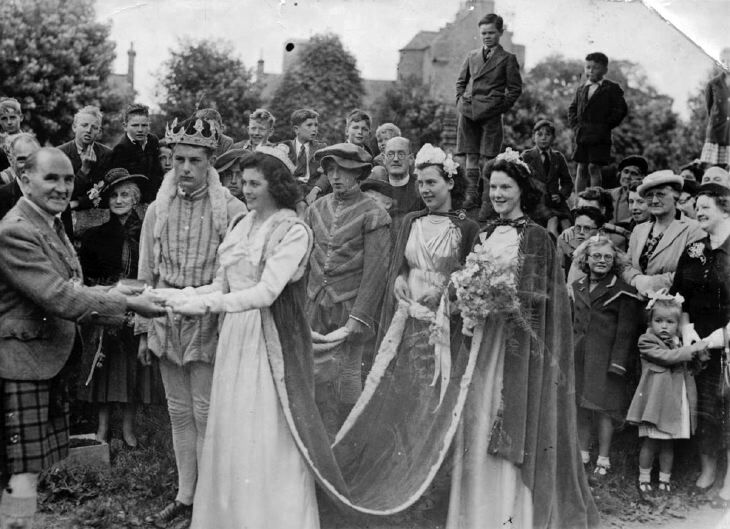 Black and white photograph of the carnival king and queen with attendants and crowd, with Sander Macdonald's father on left holding the queen's hands. My spy from that era tells me that the King is Roddy Ross, his father was the Chief Constable. The Queen is Mareen MacKenzie (Cambusmore), male attendant is Charlie Gillanders and the female attendant on the left is Margaret Bain. Boy on the wall on the far left is Peter Doull, Young Leonard is holding his younger brother, Hamish. Tall boy standing is Harry More, shorter one is Jackie Paterson, between them is Frankie Carmichael. Under intensive cross-examination Sander has strongly and consistently denied that he was ever the Carnival King. Another source from that era is sure that Bill Leslie's spy was correct in identifying the King in this photo as Roderick Ross, but thinks that the Queen's first name was Noreen, not Mareen. There are two other photos in the archive that appear to be of this carnival: 2006_228 No.2413 and 2006_232 No. 2416. The first misquotes the year as 1945 and (if Bill's and my sources are correct) misidentifies the Queen as Noel Mackenzie rather than her sister Noreen. The other gives the year as 1950 or the 1950s. My source thinks that the year 1954 given in the current entry is about right. Hi it's Noreen, now at Trevose..sister of the late Noel MacKintosh . Regarding the date; my mother left Dornoch and joined the Royal Navy – the ‘WRENS’ – in December 1954, so the comment added by Bill Leslie on 6 April 2011, suggesting an earlier date than 1954, may be correct, but it’s unlikely to be any earlier than 1953. 1954 is probably more likely. I hope this helps!